Australia is a nation that loves its gambling; Australians love to gamble, tourists Down Under are treated to some of the finest casinos outside of Las Vegas and Macau. 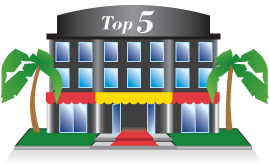 For slots and table game players, there are some sumptuous venues, but what are the top five in Australia right now? Read through our article here as we review the five casinos offering the largest number of slot games, as well as taking a look at the other games offered. 1st - Crown Casino, Melbourne - 3,500 slot games, 350 table games. The daddy of Australian casinos is, without doubt, the Crown in Melbourne. Sat on the south bank of the Yarra River, the Crown Casino and Entertainment Complex sprawls across 510,000 m2 - the biggest casino in the Southern Hemisphere and one of the biggest in the world. 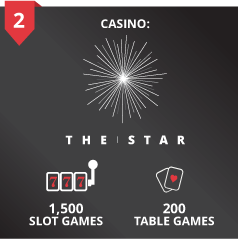 Players are able to enjoy over 3,500 pokies, with stakes available from as little as one cent. 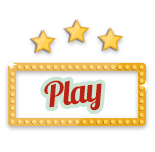 As you'd expect, every major slot game is there to be tried and enjoyed. The table games aren't slacking either. 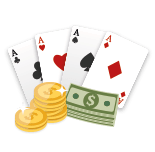 Blackjack, craps, Pai Gow, Baccarat and roulette are all on offer, and poker fans will love the fact that The Crown is home of the WSOP Asia-Pacific, as well as the home venue of the 2005 WSOP Main Event Champion, Joe Hachem. The Crown knows how to look after its customers, high roller or not. 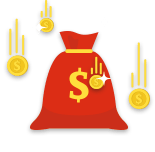 For every dollar spent either on the casino floor or in the shopping outlets, players earn rewards can then be redeemed against hotel rooms and meals at the resort. You'd be joining some exclusive company too - recent visitors to The Crown include Tom Cruise, Kim Kardashian, Katy Perry and Nicole Kidman. If you're going to visit one casino in Australia, The Crown has to be the place to go. Formerly known as Star City Casino, Sydney's imperious casino is the second largest in Australia. With a beautiful view overlooking the Darling Harbour, The Star enjoyed a refurbishment by owners Tabcorp to the tune of AU$1bn. The end result? A complex boasting two floors of gaming and an executive Sovereign Room on level three. If you want to get to the Sovereign, you'll need to apply beforehand though, with table bet ranges from AU$25 to AU$75,000. The Inner Sanctum is for the real high rollers, with bets of up to AU$500,000 available for members. While the high fliers are in the VIP areas, the rest of us are able to enjoy a staggering 1,500 slot machines across two other floors, as well as table games including Mini Baccarat, Blackjack, Caribbean Stud, Craps, Pai Gow, Poker, Pontoon, Roulette and Sic Bo. 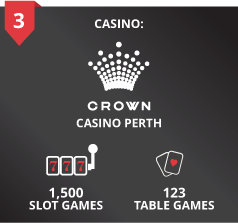 Formerly known as the Burswood International Resort Hotel & Casino, the Crown Perth is widely considered to be the best of the bunch in Western Australia. Rebranded in 2012, the casino boasts 1,500 slot machines including Keno and video poker. Table games on offer include Baccarat, Roulette, Poker and Pai Gow, amongst others. Reel-slots are banded in Western Australia, so if this is your game, you'll unfortunately be out of luck. 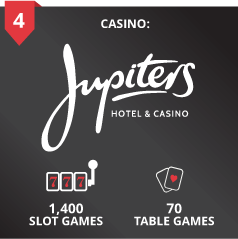 4th - Jupiters Hotel & Casino, Broadbeach - 1,400 slot machines, 70 table games. Sophisticated, suave and stylish - three words which sum up Jupiters in Broadbeach, Queensland. Think of the Bellagio from Las Vegas and teleport it to Queensland and you're not too far away. A staggering 1,400 slot games fill one floor, with Dragon Fish, Wheel of Gold and Royal Diamonds just three of the games on offer. The high rollers are able to enjoy state of the art gaming in their VIP lounge known as 'The Club'. All in all, Jupiters is the go-to place for a chic casino night out in Queensland. 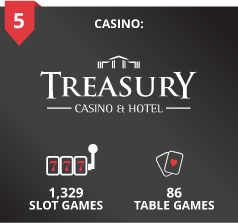 5th - Treasury Casino, Brisbane - 1,329 slot machines, 86 table games. While the Crown Perth has the modern feel to it, The Treasury in Brisbane is all about Baroque beauty. Built in the early 19th century, the historic building houses over 1300 slot games and 80 table games. 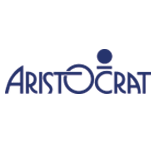 The traditional blackjack, roulette and craps are joined by modern slot game classics such as Elvis, Year of the Dragon Progressive and 5 Jewels - Fortune of Venice. Such a huge variety of games under one beautiful roof makes The Treasury an essential visit for gamblers in Australia.